Picture this: Airline pilots typically maintain what they call a "sterile cockpit" during takeoff and landing, when no communication is permitted between the cabin and flightdeck. This is to allow pilots to focus on the most difficult, and task-intensive, parts of the flight. But during the recent government shutdown - the longest in our nation's history - some pilots briefed flight attendants that there would be no sterile cockpit on their flight. They were so concerned that the shutdown had compromised security screening, they felt the need to alter safety procedures so they could be informed immediately if there were a security issue in the cabin. This is just one of many chilling stories I heard in recent weeks from flight attendants and the pilots we fly with. The shutdown put our lives and livelihoods in danger, risked the safety of everyone who flies, and threatened our entire economy. TSA agents fall victim to government shutdown. And they just happen to be protecting our airport security. Federal employees are working without pay to keep us safe. They deserve a check and more. Many Americans breathed a sigh of relief when the shutdown ended, assuming that the crisis had passed. But as your flight attendant, I need to tell you the truth: Everyone is less safe flying today than we were before the shutdown. Things will only get worse if the shutdown continues into day 36 this Saturday, the deadline for Washington to keep our government open with stable funding. Many of the people who keep our airports and our planes safe were forced to work more than a month without pay, and others were locked out completely. These are real people who suffered real consequences. No money to pay for rent, childcare, medicine - and no sense of when the nightmare would end. Imagine the kind of stress this puts on people in intense, safety-sensitive jobs. Flight attendants are not federal workers, and people have asked why we are so involved in this fight. Aviation doesn't work without federal workers. Air travel is a fully integrated operation that relies on government and private industry working together. When any link in this chain breaks down, the whole system suffers. Take air traffic controllers. On a normal day, these professionals have jobs so stressful that they're required to retire at 56. They train for three to five years before becoming fully certified and must be fit for duty on every shift. According to the National Air Traffic Controllers Association, a single air traffic controller at Chicago O'Hare is watching over as many as 20-35 planes at one time. A controller at Chicago O'Hare may be responsible for as many as 5,000 lives at any time. There is no room for error. Planes don't get into fender benders. Similarly, I spoke to transportation security officers who couldn't even afford gas to get home or back to work, so they slept in their cars between shifts. Some simply couldn't afford to stay on the job, leading to long check-in lines - and the overall stress increased the risk of a security breach, endangering all of us. Most Federal Aviation Administration staff who conduct safety inspections of planes were furloughed, leaving critical gaps in safety. If these workers are locked out again, there will be a higher chance of issues such as mechanical failures, planes grounded and flights canceled because aircraft can't get certified. The FAA was rolling out new equipment to prevent incidents where a plane takes off or lands in the wrong place - incidents that happen at least twice a day and cause too many near misses. But this program, and others, were put on hold during the shutdown and haven't been restarted because agencies don't know whether they will be closed again. If the shutdown continues, we won't know when or where problems could happen, meaning travel could be disrupted at anytime, anywhere - and that's not even counting the damage if there's a serious incident. 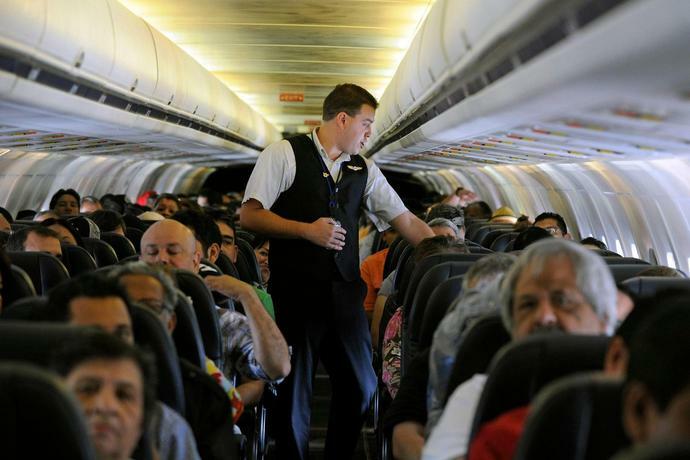 Flight attendants are aviation's first responders and the last line of defense. We take our responsibility seriously. That's why, through our unions, we've fought to ban smoking on planes, to keep knives out of the cabin and so much more. Now, we are once again standing up for safety. There are serious issues we need to debate as a country, but our democracy and economy only work when the basic functions of our government are in place. It is immoral to put American lives in danger with reckless political games. There is bipartisan support to keep the government open with stable, long-term funding. Americans overwhelmingly support this solution. But if Congress ignores the will of the American people and take us to Day 36 of the shutdown, flight attendants will not risk the lives of our colleagues and our passengers. We have a duty to protect ourselves and the American people from the danger. Working people have power when we come together. If Congress chooses the chaos of a continued lockout, we will use that power. BERLIN (AP) - The German government on Wednesday slashed its 2019 economic growth forecast for the country for the second time this year, halving its outlook to a meager 0.5%.